Back to the trail after the wedding, but pondering the life of the village shop and the glory of the penny post en route. The wedding reception had been held at Low Bradfield Village Hall, a few miles west of Sheffield. Sheffield is an amazing town, the steep-sided valleys, which were once the powerhouse of countless mills that created the city, are inhospitable to housing, so, within a mile of the city centre you are in wooded nature conservation areas that extend out to the moors, and villages like Low Bradfield that feel as though you are deep in the heart of the country. Nestled amongst hills, the only sound is the odd passing tractor, and the crack of leather on willow on the busy village cricket ground. After the reception, we stayed at a small cottage, just behind the village store and post office, and yards from the village hall. Village shops are often the heart of a community, and for those without cars, essential for day-to-day life, and yet over many years, they have been closing down. One reason is that those with cars do most of their shopping in supermarkets, only using the shop for ’emergencies’. So, while they would regard the shop as important, this is not reflected in the money spent there. Of course the shop cannot compete in terms of price, but more importantly in the range of goods supplied. This is precisely why, more than twenty years ago now, I began to articulate the notion of the electronic village shop, where a combination of regional picking lines and electronic stock control could enable just-in-time ordering, both of staples (just six tins of beans in the store rather than a box), but also of individual customer orders. I imagined a customer walking in in the morning, saying, "I’m cooking lasagne for dinner", and when they arrive back after work, there at the shop are all the ingredients ready for them. At the time, pre-web, pre-online ordering, this would have been complex, needing new logistics; now it would be straightforward. Another threat has been the gradual demise of Post Office business. The shop was often also a small post office, but the number of small post offices, both in the country and city, has declined as the overall Post Office business has shrunk. Part of this has been the deregulation of posts, including the separation of post office counter business from Royal Mail, who deliver the mail, and also the opening up of the delivery business to other players. This has meant that a large proportion of business posts, the posts that were easy and cheap to collect and deliver, are now sent by independent companies, whereas Royal Mail picks up the rump of individual letters from post boxes and small parcels, more complex and costly to collect and deliver. Add to this the decline of letters with the rise of email and both Royal Mail and the Post Office are constantly under pressure. Living on an island, the glory of the post office and Royal Mail are evident. When we go off island we tell the post office, which is also the Royal Mail sorting office, or the postman notices, and instead of a pile of mail crammed untidily through the letter box on our return, we simply collect a neatly rubber-banded package as we come off the ferry. When we order things through the internet, whenever possible we order from suppliers who deliver by Royal Mail. This is because a First Class Royal Mail letter that is posted by 4pm pretty much anywhere in the UK will arrive on the noon plane on Tiree and be with us by early afternoon. In contrast, DHL, or any of the other ‘express’ delivery methods, will end up waiting in a warehouse in Oban for days, and it may be up to a week or 10 days before we see an ‘overnight delivery’. Furthermore, and given the extra costs and complexity from a business point of view, quite justifiably, many carriers charge extra for the privilege of delivering your week-late parcel. The Royal Mail must lose money on every letter and parcel it delivers on Tiree, but it does so, because it is providing a universal service. It is impossible to overstate the revolutionary importance of the Penny Post. Before its introduction, when you sent a letter the cost was dependent on the route taken. Each carrier along the way charged, which either had to be estimated and paid upfront, or paid by the recipient, before they knew the contents! It was complex for the sender and receiver, but made perfect business sense, given the need for each carrier along the way to make a living. The Penny Post did away with this, a letter cost the same no matter if it was going round the corner, to the other end of the country, the mountainous heart of mid-Wales, or even a tiny Scottish island. But for users this meant you no longer had to worry about where your letter was going, you just posted it. The Penny Post made communication effortless and with it simplified everyday life and, critically, commerce. Think about the web, what it would be like if you had to separately work out the cost of each web site you visit depending on the route across national and international cables. The Penny Post was an information revolution, which was copied across the world, but, in the UK, one we are in danger of losing. As well as the (shrinking) postal business, one of the mainstays of small post offices was that they functioned as the ‘bank’ of the nation, where pensions and other benefits were paid. Not only was the local post office paid for doing this service, but also it meant it brought people to the premises just when they had money, so would be likely to shop as well. However, as a cost-saving measure, benefits and pensions have increasingly been paid directly to bank accounts. For the village shop, this is a loss of crucial business, and for the individual on a low income this means it is far harder to manage money, as it becomes ‘just numbers’, rather than physical notes in your purse. Some years ago, on the morning radio, there were two successive government ministers talking, following two government department reports issued on the same day. One was talking about the Post Office and the ‘modernisation’ and ‘efficiency’ programme; the other about the problems of rural areas and in particular the loss of village shops. Somehow the two never spoke to one another. The Low Bradfield shop and post office is suffering all the problems of shrinking business, so has diversified. As well as being a shop it is now a small café. Along the way round Wales I have noticed a few village post offices with a table in a corner, but the Low Bradfield one has developed more into a fully fledged, but tiny, café, the ‘Postcard Café‘, and the day before, while waiting between stages of getting the hall ready for the reception, we had sat and had tea, coffee and buttered crumpet. I recall on the far side of Lewis a community-run shop and post office that was also a café, and I think also even had petrol pumps. 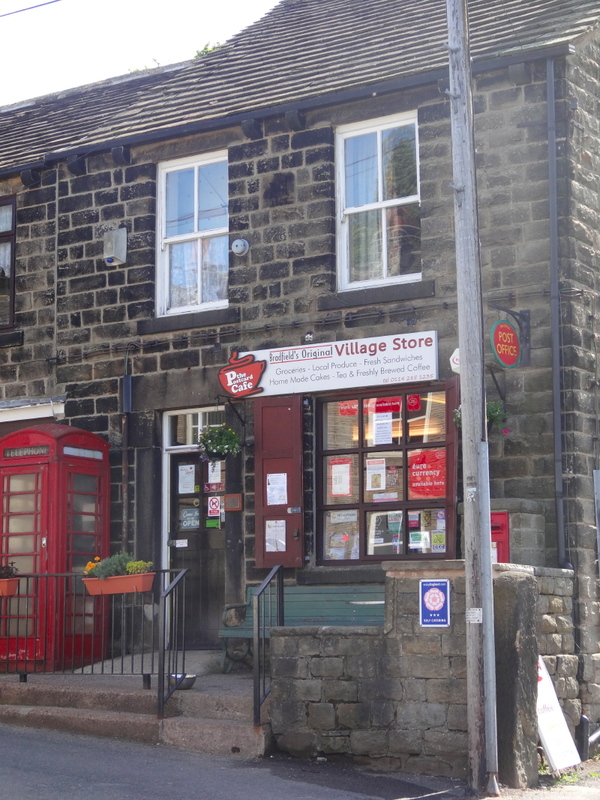 The village shop and post office often acts as a social hub of rural life, and no less the corner shop in residential areas of cities. So the loss of the shop is not only a disaster for the pensioners or farm labourers who may not have their own transport, but also tends to contribute to a loss of community identity. The web of informal community connections, facilitated by the local shop, is not only important for the social life of the village, but also critical for many vulnerable people, making it possible to survive independently, instead of becoming an expensive drain on the state. The dual function as small café is economically sensible as those who come in to buy a loaf of bread may stay for a coffee, or vice versa. However, it also strengthens the social role of the shop, not just chatting whilst collecting your pension, but staying on to continue to chat over a cup of tea. How lovely! Interestingly, one of the nicest things I did during a recent weekend in Helsinki was serendipitously visit a cafe that also does (very limited!) postal services — they sell postcards, and for a small charge will stamp and post them for you. It was notable for its clear mingling of tourists and (the majority) locals.